A pendulum that draws a rectangle, whenever the visitor makes it spin. The installation consists from a sphere that can drip ink and is hanged as a pendulum. The visitor pushes the pendulum and makes it spin. Beside the initial push, the pendulum’s movement is not controlled by any other electrical or mechanical way; it spins naturally. As the oscillation of the pendulum decreases, it covers most of the drawing surface. If the pendulum happens to be on a spot that must to be drawn, some ink is dripped at that spot. 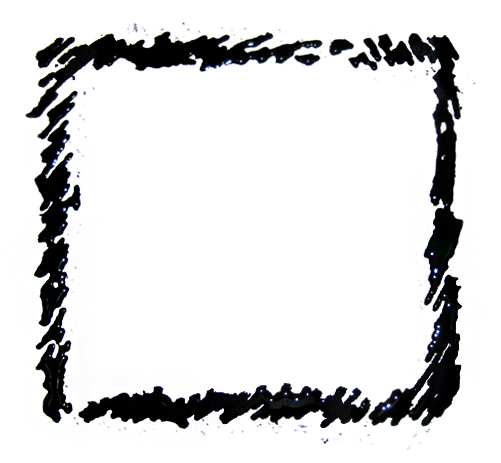 In that way a rectangle is gradually drawn. The style of the dripping generally resembles a vortex that is defined from the initial push. The oscillation lasts about 5 minutes. The short video above presents the real process that lasts about 5, at a higher framerate. Technically this installation is an anorthodox printer. The pendulum is the "head" of the printer, but unlike common printers, its position and movement is not controlled by any means, besides the visitor's initial push. Instead, the head's position and speed is precisely tracked, in order to drip ink only at the spots that must be drawn, whenever the pendulum is right above them. 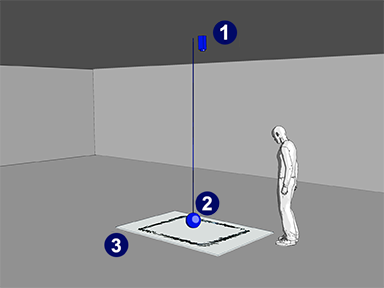 The installation components are shown in the image on the right: the visitor spins the pendulum (2); a camera (1) tracks the position of the pendulum and feeds the data to a computer (not shown) where a predefined portrait is stored; whenever the pendulum is above a spot that must be drawn, the computer commands the pendulum to drip some ink; gradually a rectangle is drawn on the paper's surface (3).